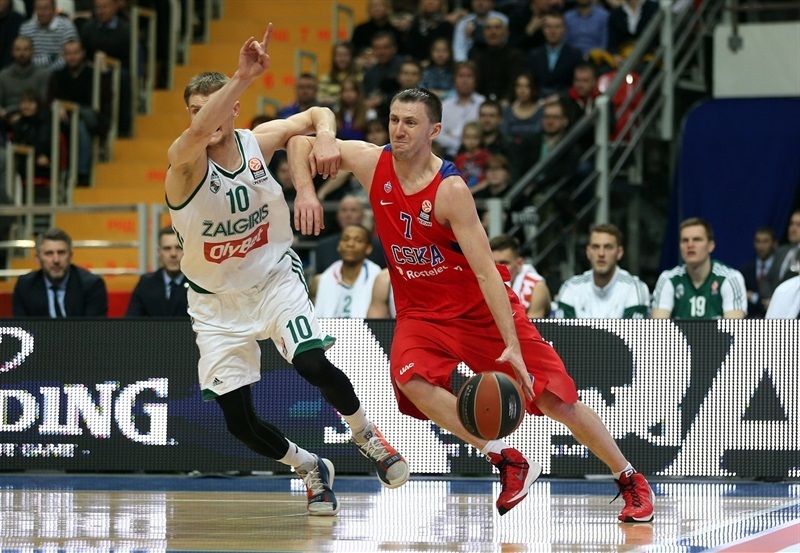 After trailing at halftime, CSKA Moscow took charge in the second half to beat Zalgiris Kaunas 100-86 and clinch home-court advantage in the playoffs. The hosts started the second half with a 14-3 charge and held on the rest of the way thanks to Nando De Colo, who starred with 26 points and 7 rebounds. The win boosted CSKA’s record to 9-4 and it can also wrap up first place in Top 16 Group F with a win next week or if Laboral Kutxa Vitoria Gasteiz loses in either of its two remaining games. Milos Teodosic added 15 points, Kyle Hines scored 14 on near-perfect shooting, all of Vitaly Fridzon’s 12 points came on three-pointers and Nikita Kurbanov contributed 11 points as CSKA reached triple digits for the fifth time this season. 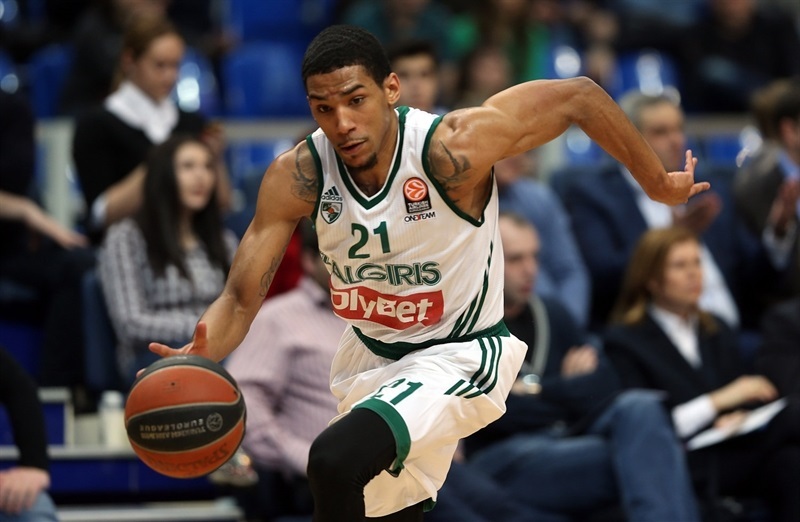 Olivier Hanlan paced Zalgiris with 15 points, Brock Motum and Ian Vougioukas posted 13 points apiece and Jerome Randle netted 10 in defeat. CSKA won the opening tip and Kurbanov muscled his way inside to open the scoring. Kurbanov added another basket in the low post before Vougioukas used a spin move to get a basket-plus-foul for the visitors’ first points. Randle used a burst of speed to get a three-point play and give Zalgiris its first lead, 4-6. 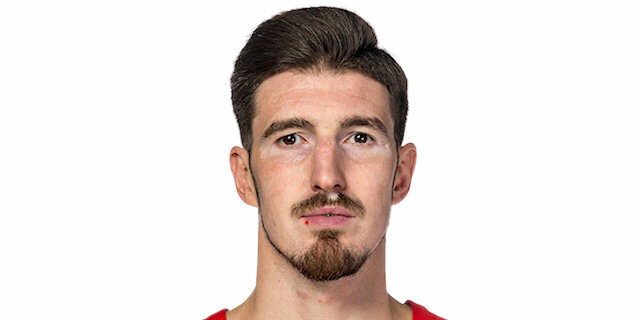 Pavel Korobkov, who made his first ever Euroleague start, took a seat after two minutes with 2 fouls and Vougioukas put back his own miss to cap a 0-8 Zalgiris run. 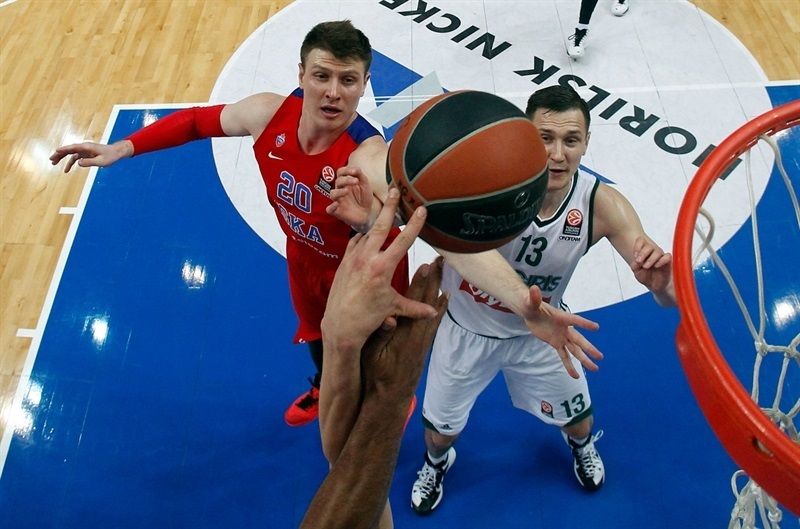 Kurbanov remained CSKA’s lone source of points with a three-point play. 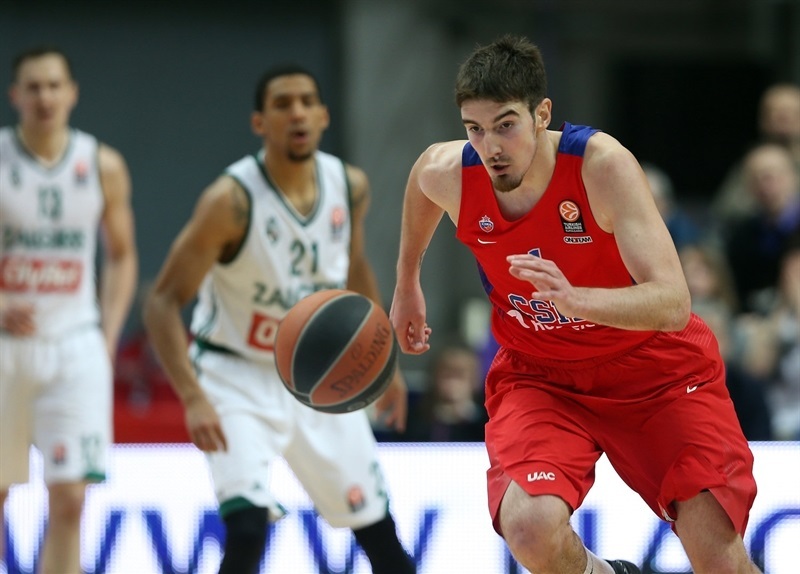 De Colo took advantage of a blown defensive assignment and drained a three for a 10-8 CSKA lead. Vougioukas tied it with free throws before the TV timeout. Hines came off the bench and scored on his first touch thanks to a De Colo assist. Siim-Sander Vene tied it only to see CKA regain the lead through De Colo free throws. Randle made it 14-15 with a three-pointer. Teodosic and Hanlan traded triples and Paulius Jankunas’s jumper made it 17-20. Hines narrowed the gap on the offensive glass. Hanlan’s second triple put the difference at 4, but Teodosic found a cutting Demetris Nichols for a slam in the final seconds of the quarter to make it 21-23. Vougioukas added more points to his tally with free throws, but Hines fought him off for an offensive rebound, basket and foul. Hines made his presence felt on the defensive end with a rejection of Hanlan. 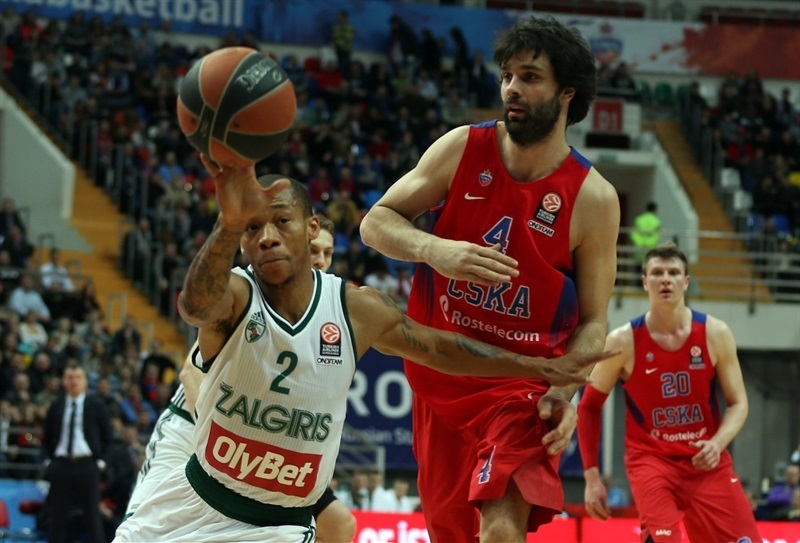 CSKA regained the lead on a Cory Higgins jumper followed by Teodosic free throws. However Hanlan picked up a loose ball and took it in for a layup and Motum buried a three to put Zalgiris back ahead, 28-30. After a Kaspars Vecvagars floater, CSKA coach Itoudis called timeout. Teodosic stepped up with a three-point play, but a Jankunas jumper and Lukas Lekavicius runner extended the Zalgiris lead to 31-36. De Colo and Jankunas traded free throws. 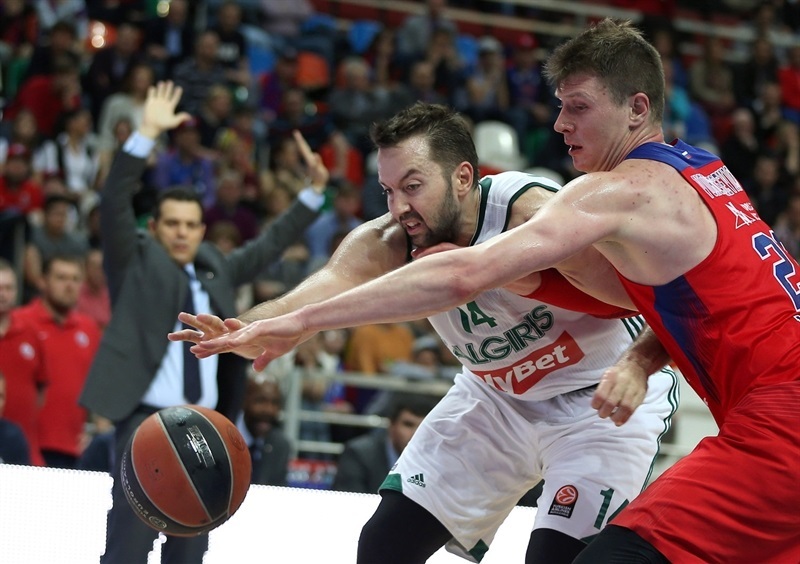 Zalgiris’s confidence grew with a Vecvagars triple before Jankunas blocked a De Colo layup. Jankunas stunned the arena when he finished a pick-and roll to give the Lithuanian champs a double-digit lead, 33-43. CSKA called timeout, after which Teodosic buried a three-pointer. Lekavicius responded with a three from the corner, but Fridzon nailed a triple as well. Free throws by De Colo brought the hosts within 5. De Colo took a steal in for a layup and then scored in transition. Teodosic free throws capped an 11-0 surge to take the lead, but Randle’s steal and score at the buzzer left Zalgiris with a 47-48 lead at halftime. De Colo looked to heat up with a three just 40 seconds into the half. Hines’s put back a minute later continued a CSKA run and Andrey Vorontsevich’s triple made it 55-48. Zalgiris responded as Edgaras Ulanovic buried a three, but Higgins finished a showtime play with a slam. After a Zalgiris timeout, De Colo scored twice more to cap a 14-3 start to the quarter and give CSKA a 10-point lead. Vougioukas looked to spark the visitors with a block of Hines and then 2 free throws, however Vorontsevich nailed a three for a 64-53 lead. Randle finished in transition and Ulanovas added a layup to revive Zalgiris. 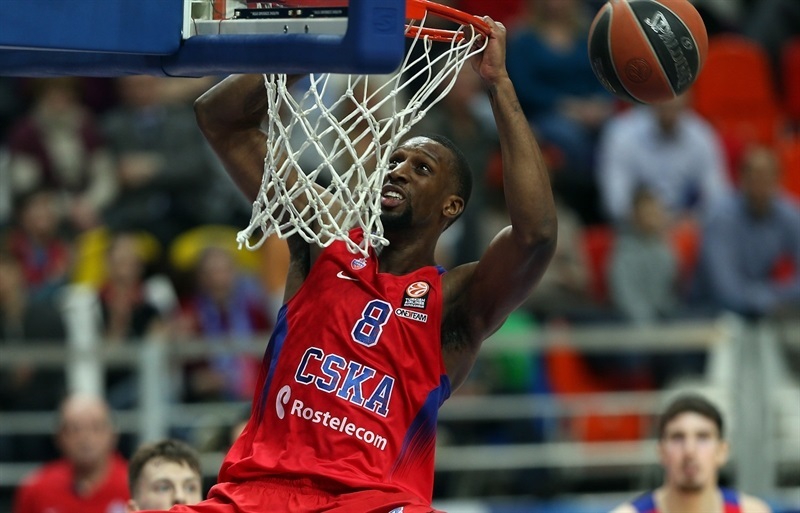 Motum finished in the paint, but back-to-back Fridzon threes gave CSKA a comfortable lead. After a timeout, Motum scored inside, but Vorontsevich matched him with free throws to end the quarter at 74-61. After Motum split free throws, Fridzon nailed his fourth three of the game. Hanlan’s layup in transition and Motum’s baseline score kept Zalgiris alive. De Colo set up Korobkov for an alley-oop layup only to see Renaldas Seibutis answer with a long jumper. Motum nailed a three to cut the gap to 79-71. Nicholas made a tough basket in the paint and Hines finished a three-point play in traffic as the CSKA lead blossomed to 13. 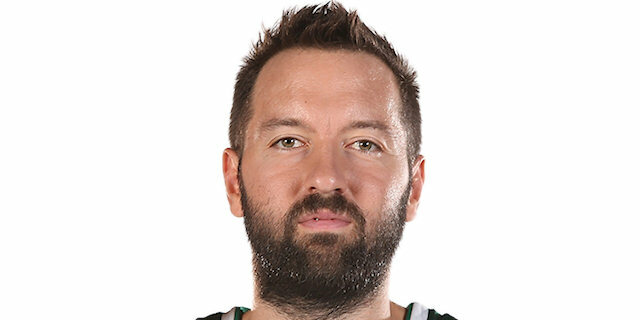 Vougioukas nailed an open jumper and Zalgiris started to press. Hines helped break the press and assisted to Nicholas. After Hanlan hit a jumper, De Colo strolled through the Zalgiris defense for a layup-plus-foul. The lead was 15 after a pull-up three by De Colo. Hanlan’s three with three minutes left was already too late. 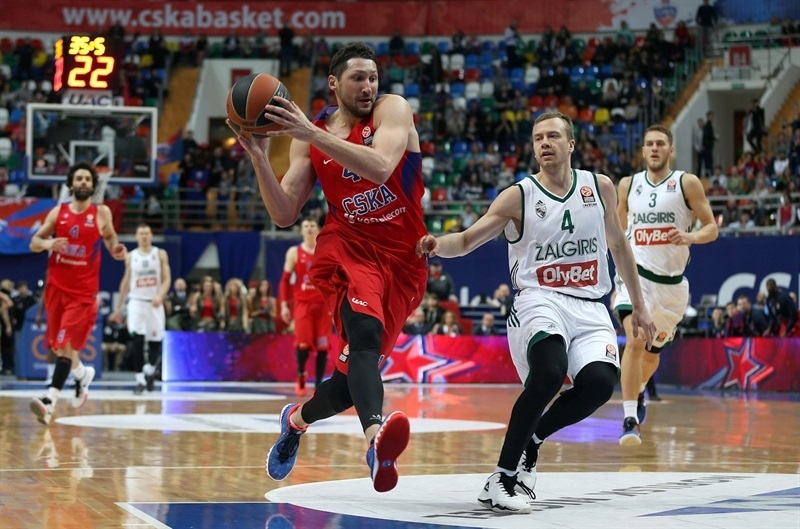 Kurbanov drove for a layup as CSKA put the finishing touches on the victory. Vytenis Lipkevicius scored his first points of the season on the offensive glass for Zalgiris. Hines’s put back and Teodosic free throws helped round out an important CSKA win. "I would like to say congratulations to everyone. We secured home-court advantage in very, very, very tough group. Please, pay attention, that we were the first team in our group to qualify, and we are the first to clinch home-court advantage. That says a lot. So I would like to thank our players, coaches, management and the fans who created great atmosphere again, who lifted the team. Even though we prepared carefully for the game, we were aware that Zalgiris has talent and plays with no pressure. We were dominant in Kaunas on both ends of the floor, but here the opponents showed that they have pride and competitiveness. They beat Olympiacos by 20, they beat Brose Baskets, they had chances against Laboral on the road. In the first half of this game we lacked effectiveness and aggressiveness on defense, we talked about it in half time, we knew that it has to be changed. And we showed immediately what we want and what we can take out of our approach; we won the third quarter 27-13, went up by 15 and controlled the game after that. It is not easy, guys. We still live in reality where we have injuries. But we don’t talk about those who are not playing, the thing that matters is who is playing. We appreciate what we have. We appreciate the effort of the guys who we don’t have now. We have one game left in the group, we go to face Olympiacos and we will see who is our opponent after that." "Overall I have more positives to say about this game than bad things. Definitely we had huge problems in the third quarter, where we weren’t tough enough and we did not go after the ball when the opportunities arose. Still I think our young guys competed well against the best team in Europe." "We knew the game is going to be difficult. They had nothing to lose and remembered the first game when we beat them by 35 points. But we were good in the second half, especially in the third quarter, tried to reach what we wanted to have in the end, to follow the plan and made a lot of shots. We managed to come back good on defense. Now we need to keep walking our path. " "Generally we played very competitive especially in the first half. 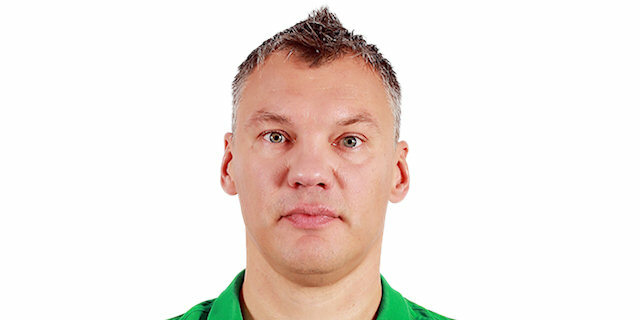 Nevertheless CSKA is a team which always punish for any mistake. Also they have probably the most talented backcourt in Europe plus Hines and other players. And they are the team which participate in Final Four every year; that says about their strength. More or less we played positive in the first half, but some problems which appeared again in the third quarter didn’t let us win."